If you had thought of going to Palma tomorrow, October 16th, think again. Tomorrow, virtually all Palma will be closed and traffic will be diverted as a massive marathon road race will be held there. 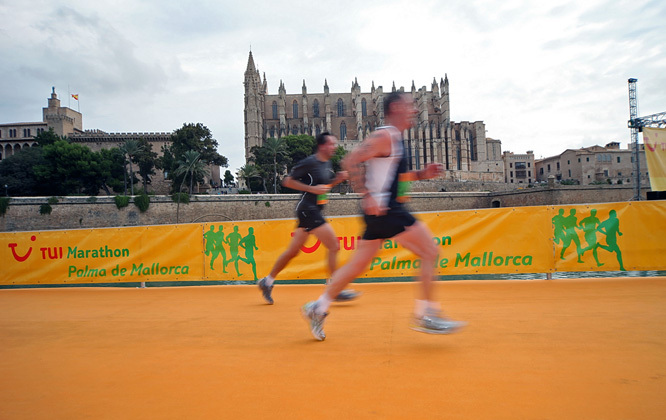 The Marathon Palma de Mallorca started in 2004 with 2,100 participants under the hospices of TUI, the tour operator. Eight years on, the annually held sporting event now attracts 8,600 runners from 53 countries, plus 2,000 kids. Tomorrow, there will be a Marathon (42.195 km), a Half Marathon (21.0975 km), a Run (10 km) and a Walking/Nordic Walking competition (10 km), as per the map (below). The Marathon will be run from Palma’s Cathedral to Arenal and back, the Half Marathon will be run in Palma’s city centre, starting from Plaça d’Espanya, and the 10 km Run will be held between Palma’s Cathedral and Porto Pi, and back again. The Walking/Nordic Walking competition will use the same course as the 10 km Run, but, will start 15 minutes later. The current world record time for men over the Marathon distance is 2 hours 3 minutes and 38 seconds. The Mallorcan athlete Miquel Capó Soler won the Palma Marathon for the last three years, finishing with a time of 02:29:23 in 2010. The fastest female runner last year was Sonja Oberem from Germany with a time of 02:47:29. The 2010 Half Marathon was won by Bruno Heuberger from Switzerland in a time of 01:10:37 in the male category and by Josefa Matheis from Germany with a time of 01:22:05, in the female category. A UNICEF Kids Run will be held this afternoon (October 15th, at 17h00) in Palma’s Avinguda Antoni Maura. The organizer, TUI, will sponsor each participating child with a 5 € donation for UNICEF and the initiative Water for Niger. Some 2,000 youngsters between 2 and 12 years of age will compete in five age groups. The photo (top) and the map were borrowed from the Internet, courtesy of tui-group.com and the photographer, Ralf Graner.